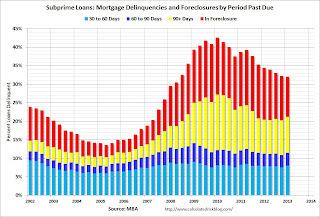 The following graphs show the percent of loans delinquent by loan type based on the MBA National Delinquency Survey: Prime, Subprime, FHA and VA. First a table comparing the number of loans in Q2 2007 and Q1 2013 so readers can understand the shift in loan types over the last several years. Both the number of prime and subprime loans have declined over the last 5+ years; the number of subprime loans is down by about 33%. 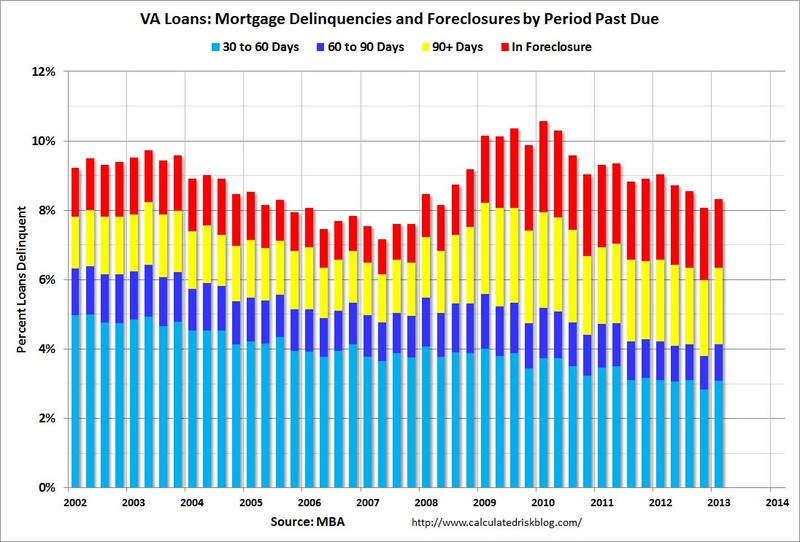 Meanwhile the number of FHA loans has more than doubled and VA loans have increased sharply. Note: There are about 41 million first-lien loans in the survey, and the MBA survey is about 88% of the total. 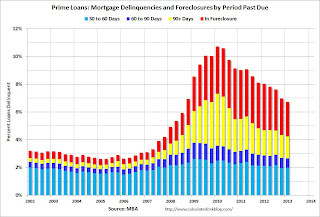 For Prime and Subprime, a majority of the seriously delinquent loans were originated in the 2005 to 2007 period - and these loans are still in the process of being resolved through foreclosure or short sales. 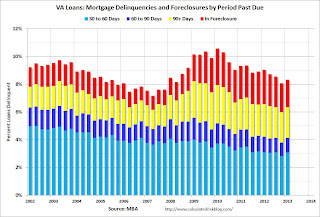 However, for the FHA, a large percentage of the seriously delinquent loans were originated in 2008 and 2009. That is the period when private capital disappeared, and the FHA share of the market increased sharply. 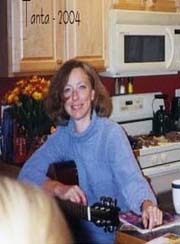 Luckily the FHA had a small market share in 2005 and 2006; however they did make quite a few bad loans in that period because of seller financed Downpayment Assistance Programs (DAPs). These were programs that allowed the seller to give the buyer the downpayment through a 3rd party "charity" (for a fee of course). The buyer had no money in the house and the default rates were absolutely horrible. (The DAPs were finally eliminated in late 2008). First a repeat for all loans: Loans 30 days delinquent increased to 3.21% from 3.04% in Q4. This is just above the long term average. This is seasonally adjusted, and the seasonal adjustment is difficult right now. Not Seasonally Adjusted basis (NSA) the 30 day delinquency rate declined in Q1 to 2.86% from 3.21%. Delinquent loans in the 60 day bucket increased slightly to 1.17% in Q1, from 1.16% in Q4. (NSA was also down significantly for the 60 day bucket). The 90 day bucket decreased slightly to 2.88% from 2.89%. This is still way above normal (around 0.8% would be normal according to the MBA). The percent of loans in the foreclosure process decreased to 3.55% from 4.74% and is now at the lowest level since 2008. Note: Scale changes for each of the following graphs. The second graph is for all prime loans. This is the category with the most seriously delinquent loans. Back in early 2007 when Fed Chairman Ben Bernanke said "the problems in the subprime market seems likely to be contained", my former co-blogger Tanta responded "We are all subprime!" - she was correct. 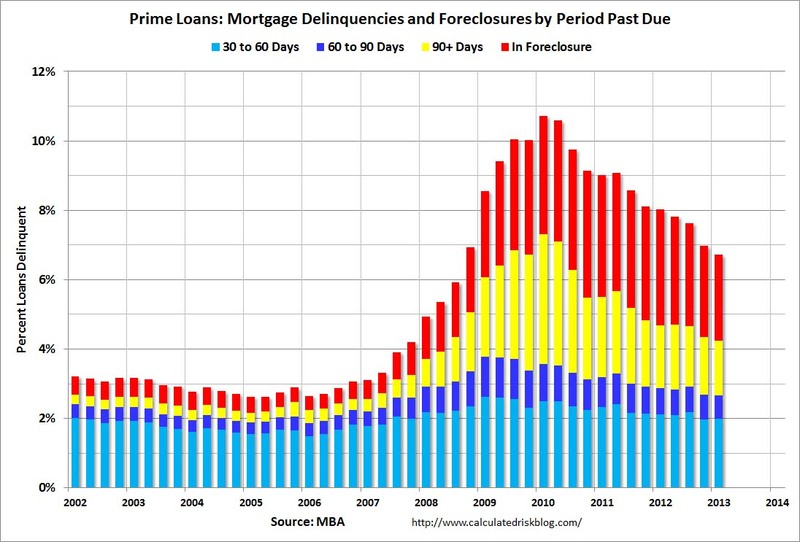 Since there are far more prime loans than any other category (see table above), about 43% of the loans seriously delinquent now are prime loans - even though the overall delinquency rate is much lower than other loan types. This graph is for subprime. This category gets most of the attention - mostly because of all the terrible loans made through the Wall Street "originate-to-distribute" model and sold as Private Label Securities (PLS). Not all PLS was subprime, but the worst of the worst loans were packaged in PLS. Although the delinquency rate is still very high, the number of subprime loans has declined sharply. 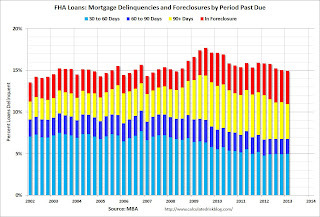 This graph is for FHA loans. It might surprise people, but the percent of FHA delinquent loans (not including in foreclosure) is at the lowest level in a decade. 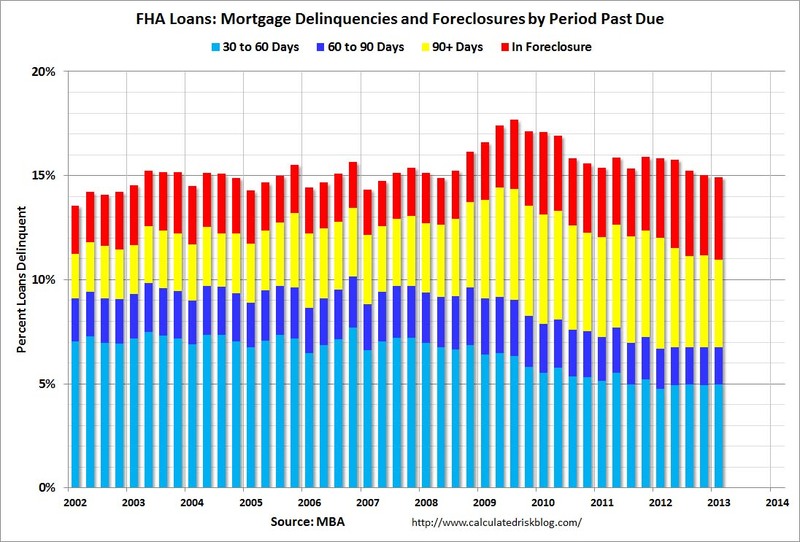 That is because the recently originated loans (2010 through 2013) are performing very well, and the FHA originated a large number of loans in that period. 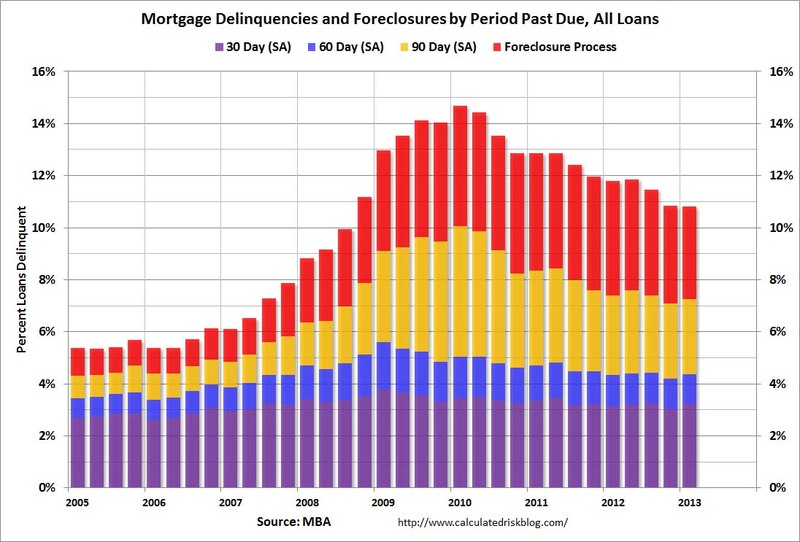 Of course there are still a large number of loans in the foreclosure process, and the remaining DAPs and the loans originated in 2008 and 2009 are performing poorly. The last graph is for VA loans. This is a fairly small but growing category (see table above). 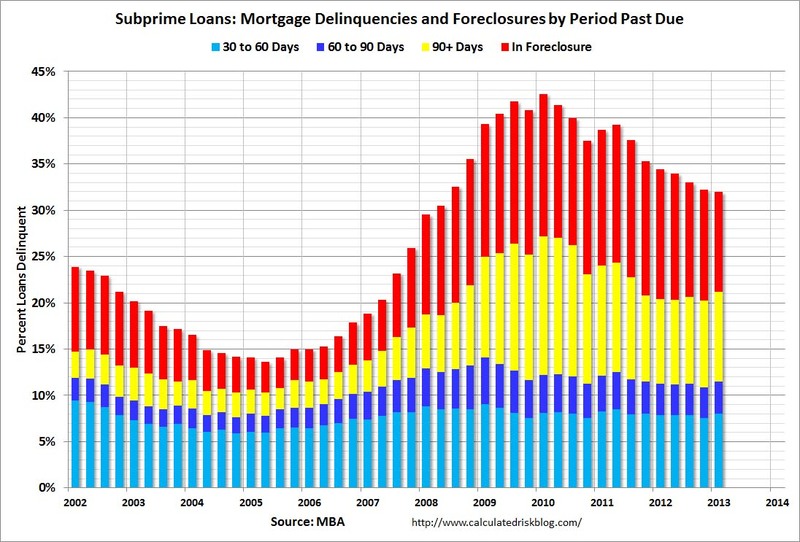 Overall there are still quite a few subprime loans that are in distress, but the real keys going forward are prime loans and FHA loans.